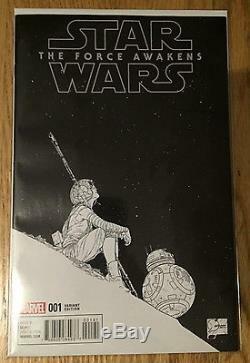 Star Wars: The Force Awakens #1 1:300 Joe Quesada Black-and-White Sketch Variant. (Marvel, 2016), written by Chuck Wendig and drawn by Luke Ross. The item "Star Wars The Force Awakens #1 1300 Joe Quesada B&W SKETCH Variant (NR)" is in sale since Thursday, September 01, 2016. This item is in the category "Collectibles\Comics\Modern Age (1992-Now)\Superhero\Mixed Items". The seller is "fastidious4" and is located in Brooklyn, New York.